Between smartphones, smart watches, smart TVs, and even smart thermostats, it’s becoming pretty clear that the future of technology is an intelligent one. And why shouldn’t it be? After all, artificial intelligence has the capacity to be the next frontier in digital technology. As new digital systems learn how to learn, we will be able to transition our tools into actual, reliable assistants. We’re actually building digital helpers — ones that are capable of accurately and efficiently performing complex tasks on our behalf. But it’s not quite as straightforward as all that. Machines don’t simply evolve artificial intelligence; they depend on talented programmers to make it happen. With smart tech becoming more and more commonplace in everything from big-data analytics all the way down to automated vacuum cleaners, focus is shifting towards a new science, one that has the capacity to achieve what was once only possible in science fiction: machine learning. At its most basic, machine learning is the process by which systems and computers learn to use available data to make accurate predictions. Another definition of machine learning comes from Stanford University, and suggests that machine learning is “getting computers to act without being explicitly programmed.” It’s cutting edge stuff, and it’s absolutely everywhere. As you type, you’ll likely notice that long before you’re ready to hit ‘enter,’ your search engine is already making predictions about what you might be asking. For example, upon typing “what,” Google may suggest What channel are the Oscars. Typing “What is,” might result in Google offering What is the weather like today. 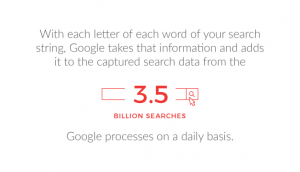 With each letter of each word of your search string, Google refines its predictions. 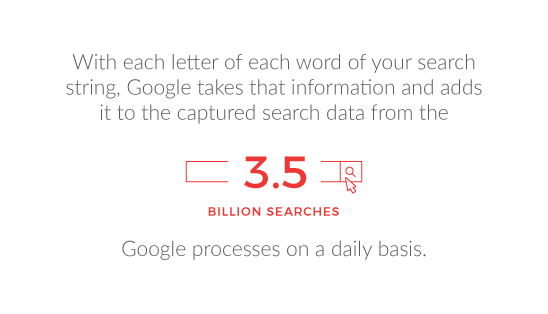 And whether or not it’s able to accurately anticipate that you’re interested in What is machine learning, it takes that information and adds it to the captured search data from the 3.5 billion searches Google processes on a daily basis. It compares the popularity of related and unrelated searches, factors in other potentially relevant data such as your location and language, considers similar searches you have performed in the past, and using a string of complex learning algorithms, distills all that info down within a fraction of a second to deliver an educated guess at what you’re looking for. The Google example serves to demonstrate that machine learning is an incredibly intricate process. But at its core it all comes down to patterns. You feed the learning algorithm some data, it identifies patterns in the data, and then it attempts to predict future patterns. What’s worth noting is that the accuracy of the algorithm is dependant upon the amount and the quality of the data. More data allows the machine to see less obvious patterns; better data allows machines to see the patterns more clearly. In essence, machine learning attempts to build an accurate model of what has happened in the past, and then applies its findings to predict the future. And to do that, it relies on three main methodologies. When you attend a class or train for a new job, there’s a good chance that your learning is being supervised by an expert. These experts present you with problems and provide you with the right solutions. They then give you similar problems, and you use what you learned from the previous problems to come up with (hopefully) correct answers. Supervised machine learning operates in much the same way. Supervised machine learning uses labeled data — a training data set where each example is tagged with the ‘correct’ answer. The system would see the patterns in the training data. Then, when presented with test data, it would apply those patterns to inform its predictions. How well it does on the test acts as a performance measure for the model in general. Supervised learning is effective in classification and regression. Classification is used when you’re interested in discrete values. So, if you’re building a program that can answer the question of whether the Red Sox will win the World Series (yes or no), or one that can identify whether a picture is of a horse or a donkey, then you’d be dealing with classification problems. On the other had, if you’re looking for continuous values rather than discrete values, then you’d use regression. Continuous values can be essentially any number (such as when trying to predict stock prices). They have no value constraints, and tend to involve a lot of variables. Supervised learning is a good way to teach machines when you have access to labeled data sets. Unfortunately, things aren’t usually so cut and dry. Outside of the lab, labeled data isn’t always available. In these cases, unsupervised learning is the next best thing. In unsupervised learning, the learning model is presented with data but no specific solutions. There are no clearly predefined ‘right’ or ‘wrong’ answers, and in many cases, the researchers in charge don’t know the answers to the questions that are being asked. It’s up to the algorithm to organize the data on its own to find any relevant patterns. Depending on the data and the problems, the model may look for structure by finding similarities in the data (clustering), detecting unusual patterns that don’t fit with the overall structure (anomaly detection), or by looking at key attributes of the data and predicting other commonly associated attributes (association). Finally, we come to reinforcement learning. Much like the lab mouse running a maze to reach some cheese, reinforcement machine learning relies on a set of rewards and penalties. That may sound ominous, but it’s really not. Reinforcement learning is essentially just trial and error. The model is given an objective and is told to pursue it. It does so, fails, learns from the experience, tries again, fails again, learns, and keeps going until it reaches its goal. The key here is that every failure eliminates one avenue of possible failure in the future, and by allowing the machine to try again and again, it becomes progressively better. And with enough data backing it up, it can become very proficient. How efficient? Well, reinforcement learning is responsible for the development of the self-driving car. So, we’ve covered the basics of “What is machine learning?” Now, let’s talk briefly about why it matters. 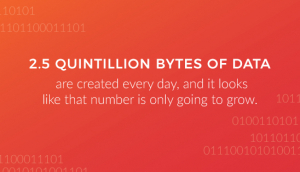 It’s said that we live in the Digital Age, but it might be more accurate to say that we live in the Age of Data. With the internet occupying such a prominent role in the center of our everyday lives, and with more and more previously analogue devices (like that thermostat we mentioned earlier) joining the connected global community, we as a civilization are creating massive amounts of data. How much, specifically? 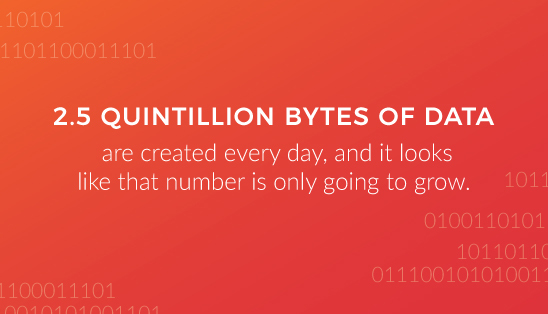 Well, it’s estimated that 2.5 quintillion bytes of data are created every day, and it looks like that number is only going to grow. And in addition to the data we create, we’re also becoming better at capturing and evaluating other data sets, such as those having to do with the environment and human psychology. In this data, businesses, researchers, developers, and more see the opportunity to develop valuable predictive models. When is someone most likely to buy? What is the likelihood of a hurricane developing at a certain time and place? How do site visitors react to specific web-page formats? The answers to each of these questions (and hundreds of thousands of others) may lie in the data. But before we can extract them, we need artificial intelligences capable of sifting through huge amounts of information and identifying the big-picture structures hidden within. Why does machine learning matter? Because it’s becoming an integral part of the modern world, and the possibilities are limitless. Artificial intelligence and machine learning really are the new digital frontier. Be on the forefront of that frontier. With a coding education, you’ll have the programming foundation you’ll need to take your first steps into the growing world of machine learning. Hackbright Academy Is Coming to the South Bay!